Camille and Charlotte are social activists interested in the juncture between the Transition Movement and social justice. 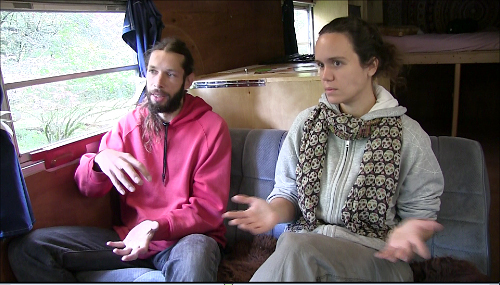 In 2009 they set out with their two young children in The Transition Bus to travel North America. They were especially keen to visit and video projects like worker-owned cooperatives and transition projects with low income populations. 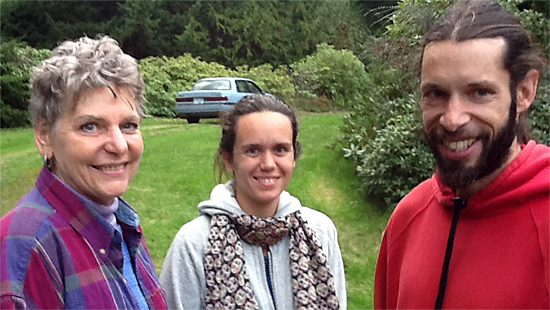 We caught up with them on Denman Island, B.C., off the coast of Vancouver Island, where they’re staying for awhile as their boys attend school. Camille, Charlotte and I plunked ourselves inside The Transition Bus—a school bus converted into a biodiesel-powered home on wheels. Jeff Lillie, a community oriented biodiesel manufacturer in the Florida Keys whose priority is fueling vehicles owned by locals first, and tourists second. Patrick Garvey, working with low-income people in the Florida Keys (5 minute video). Scott Crow, working to strengthen the worker-owned cooperatives network in Texas. Tim Huet and the Arizmendi Bakery network of worker-owned cooperatives in San Francisco, Marin and East Bay. They’re modeled on Spain’s Mondragon worker-owned cooperatives. After our conversation, Charlotte and Camille provided us contact information for people they met on their Transition Bus travels, people we might want to visit on our Peak Moment road trip—a perfect example of the reciprocity and generosity we are finding everywhere we travel.